Hi! If you are reading this chances are it’s probably because you searched for easy, last minute, handmade gifts to give to grandparents or family members. Believe me, that is EXACTLY what this is! This Christmas season one morning I was frantically trying to think of a heartfelt gift to give to the grandparents from my son. I searched amazon high and low for “grandparent gifts” and nothing really stuck out. I went to my go to Pinterest and started to search for homemade grandparent gifts. A whole cornucopia of ideas popped up and one that was incredibly cute was a snowmen ornament made out of hand-prints. How Cute! We recently moved into a new home in the beginning of December *yay* and with it we also inherited a few things that the previous owners left behind. Looking around, I realized that we were never going to use the wine glasses they had left (we own more than I am proud of already) and I looked at Kaleb and said, “You want to paint a craft with mommy today?” What toddler says no to paint?? These were simple supplies that I had on hand already but in case you are new painting here are some things you will need! 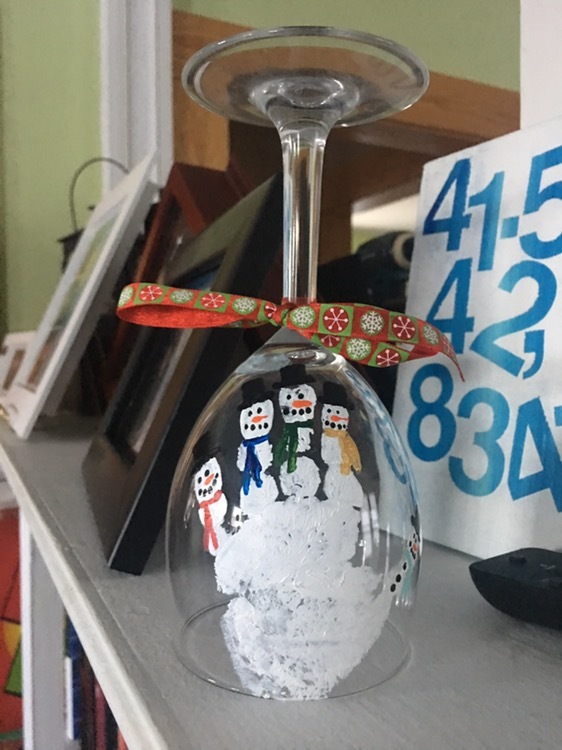 Wine Glass, Ornament, Canvas – the options are endless! This craft will probably work best with a sleeping newborn, or an older toddler. I tried to do a few handprint and footprint crafts with my little guy when he was younger and it never worked out due to a squirmy baby! First things first!!! Make sure you are starting with your toddler strapped into his or her high chair or booster seat, wearing old clothes you don’t mind getting paint on (for both of you!) This is a messy craft. I was able to come away unscathed as this literally was a last minute decision one morning (I tackled this before coffee mind you.) I had no idea it was going to happen. I just looked over, saw the wine glass and decided to go to town! When you have all your supplies set up (you will only need the white paint and the foam brush to start) Coat your little one’s hand with white paint using the foam brush. Then, take your object you are using, in my case, wine glass and gently press your little one’s hand onto the glass. Press down all their fingers gently and then slowly and gently peel their hand away. You just made a successful handprint! You may have to touch up some parts of the handprint where their little hand either smudged or didn’t quite touch the glass. You can do this with the white paint and a small paint brush. Next step, and I can’t stress this enough, is to let your handprint dry thoroughly. You will need to cover some of it and you don’t want your colors mixing together. After a few hours of dry-time, it was nap time and I was able to complete the snowmen! The best part about making a present by hand is giving it to the person and know that they will cherish it forever! If you have pictures of your handmade snowmen handprints I would love to see them! Post them in the comments section below!